‪#‎Falana‬ has woken up after we gave him the alarm about the fascist abuse of power by‪#‎Fashola‬. Our learned gentleman #Falana. Speeches are not enough we need to take LASG to court and sue for 5 billion Naira. We will get fair hearing in the Supreme Court! Today, at the NBA Secretariat Ikeja Lagos, Femi Falana (SAN) and the entire membership of one of Africa’s largest local bar decried the continuing harassment of indigent and poor citizens by the LAGOS STATE government in various guises designed only to raise more money or to “save” money for the current wielders of political powers in the State. 1. using the apparatus of its uniformed outfit – notably members of its Kick Against Indiscipline, KAI, squad – to take hostage poor Lagosians under the guise of enforcing so-called state “laws” against “street trading”, “highway crossing”, loitering, begging and playing football on deserted streets during the monthly “environmental sanitation exercise”: dubious so-called infractions against so-called laws which do not, according to Femi Falana, “belong in a civilised society”, not to talk about a constitutional democracy. 3. Operating kangaroo tribunals sanctioned by the Chief Magistrate of Lagos State and manned by lawyers as “judges” and”prosecutors” who preside over proceedings which does not protect an “accused’s” basic constitutional right to fair hearing especially the right to representation by counsel or to take a “not guilty” plea. Tribunals that brazenly inform “accused” persons with very strategically placed banners that defence “lawyers” are not “necessary” for its proceedings. In those tribunals, appearance is a formal statement of guilt which in most cases covers several “criminal” counts each of which attracts financial penalties of N10,000 or more and imprisonment (at least, until payment). 4. For incarcerating hapless and indigent citizens of Nigeria in Kirikiri Maximum Prison and Badagri Prisons for pending to pay up their imposed fines. NBA Lagos and its member resolved to set up a high powered committee to document specific instances of the abuses so as to know the best way to address what is clearly an unacceptable and disgracefully course of dealing by a court led by a Senior Avocate of Nigeria, Babatunde Fashola, SAN. 1. expresses its outrage at the scandalous past-time of mowing down defenceless citizens by Lagos State in the name of “security” “urban renewal” and “development”. It is unacceptable that “roundabouts”, grasses and ornamental flowers seem to receive better treatments in Lagos State than poor and indigent persons. 2. calls on Lagos State government to review the operations of its uniformed and other tax-payers funded operatives so as to bring their operations under the constitutional imperative of making the welfare and security of the People (instead of their brazen operation) the primary purpose of government. It could not and must not be the case that those outfits – majority of which were initially populated by fringe or indigent members of Lagos (especially the notorious agberos) – were strategic enlistment by the State governments of a tiny percentage of the poor to be used as tools to oppress the majority of their fellow poor. That is the kind of evil that destroys any place. 4. calls on all the NBA Branches in Lagos State – Lagos, Ikeja, Ikorodu and Badagry – to rise up, condemn these evil practises going on Lagos State and take the active step of picketing all those so-called tribunals and detention centers. The Bar must also rise up and demand the release of poor Nigerians rotting away in maximum prisons – possibly for life – since they are unable to pay the fines imposed upon them by agents of Lagos State government. 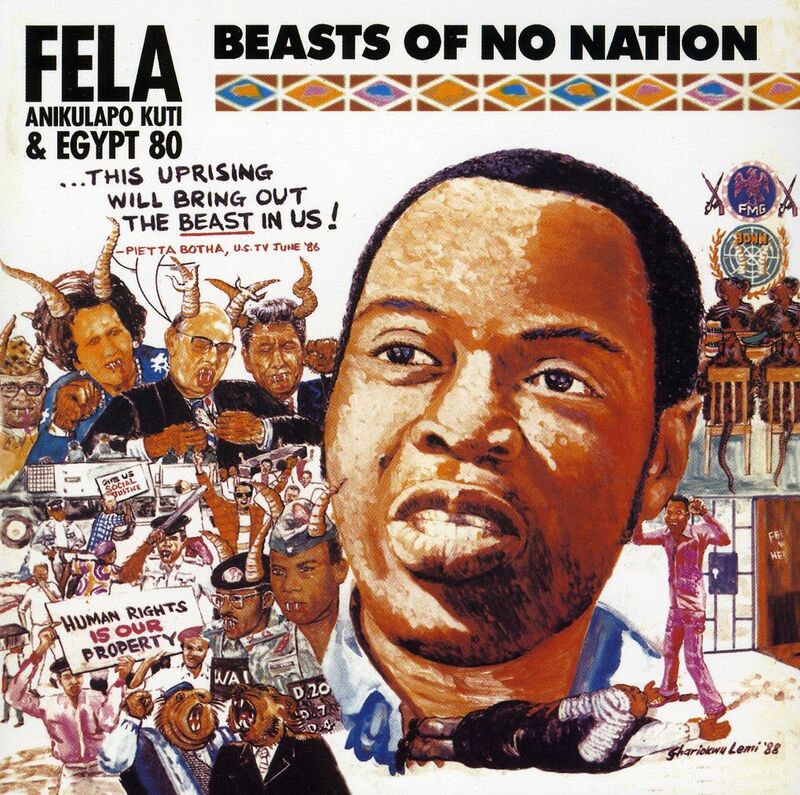 In Fela Anikulapo Kuti’s hit song ‘Beast of No Nation.’ Thatcher was described as an ‘Animal in human skin.’ This was 1986. Former British Prime Minister Maggie Thatcher one of the Beasts of No Nation has died following a stroke. She was 87 years old. A relic of the ‘Cold War’ she was friends with Ronald Reagan of the United States and PW Botha of apartheid South Africa. 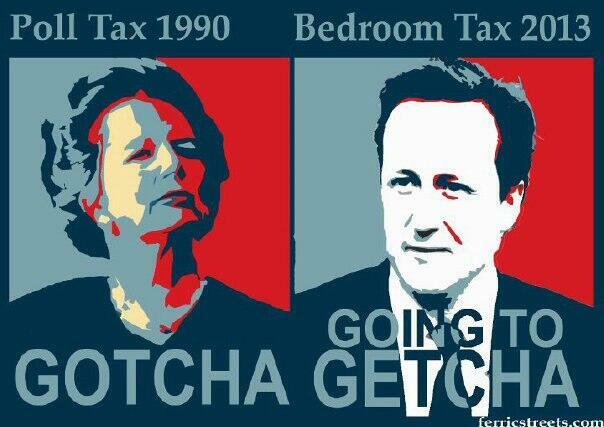 Her Legacy lives on in the form of more taxes on the common British people. 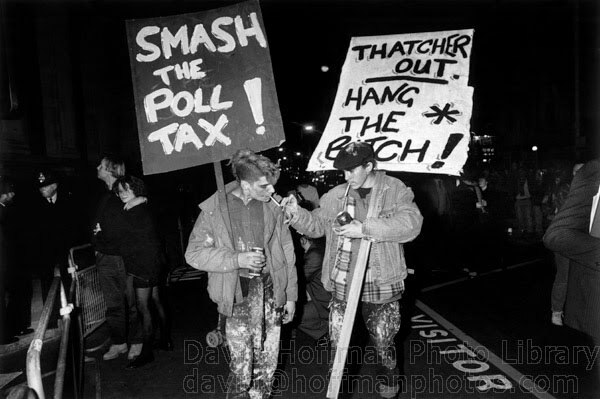 The Poll Tax Riots were a series of mass disturbances, or riots, in British towns and cities during protests against the Community Charge (commonly known as the poll tax), introduced by the Conservative government led by Prime Minister Margaret Thatcher. By far the largest occurred in central London on Saturday 31 March 1990, shortly before the tax was due to come into force in England and Wales. The disorder in London arose from a demonstration which began at 11am. The violent confrontations between the Metropolitan Police Service and demonstrators ended up in rampaging and looting that ended at 3am the next morning. This unrest is sometimes called the Battle of Trafalgar, particularly by opponents of the Community Charge, because much of the rioting took place in Trafalgar Square. David Cameron is the reincarnation of Margaret Thatcher in the Spirit world.